Quick reaction forces of overwhelming maritime and air power have traditionally formed the basis of power projection doctrine, however, rapidly deployable airborne and amphibious forces serve as critical force multipliers at both the tactical and strategic level. 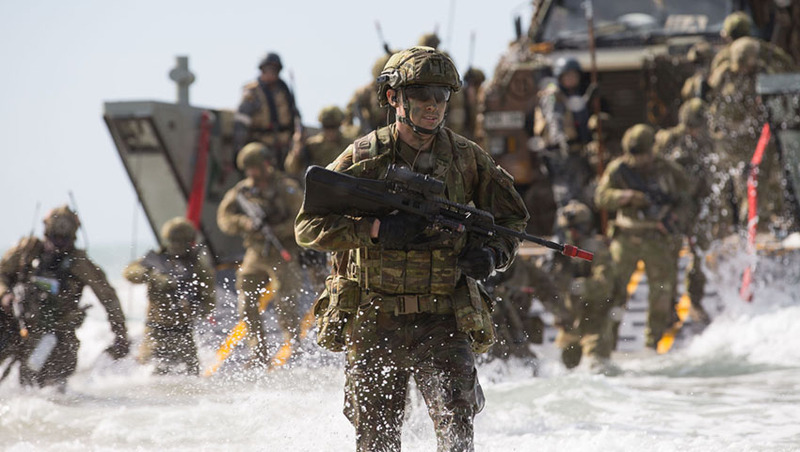 Australia’s pursuit of a dedicated amphibious force is a step in the right direction down a long-path towards developing a robust power projection force. Driven by the tactical and strategic realities of the European and Middle East theatres, combined with the painful lessons learned throughout the bloody Pacific war against Japan, the evolution of both tactical and strategic air and sea lift capabilities during the Cold War served to radically reshape the power projection calculus for nations ranging from the US and UK to Australia. Traditionally more cumbersome then deploying fleets of warships or forward deploying strategic fighter and bombing forces, which form the offensive tip of both power projection and strategic deterrence spears, ground-based quick reaction forces (QRF) serve a distinct role within the tactical and strategic calculations for policy makers and strategic leaders. While the development and introduction of powerful defensive technologies, namely the introduction of advanced anti-access, area denial (A2/AD) systems like those introduced in the South China Sea by the People's Liberation Army and supporting branches, poses a threat to the use of ground-based power projection forces, force structure and doctrine is, like technology, in a state of constant evolution to overcome these tactical and strategic challenges. Australia's pursuit of a dedicated amphibious force in the 2nd Battalion, Royal Australian Regiment (RAR) as part of Plan Beersheba makes important progress in developing Australia's land-based power projection capabilities, particularly following the reorganisation of the airborne 3rd Battalion, RAR in 2011, resulting in all airborne (parachute) operations being maintained by Australian Special Operations Command (SOCOMD). Australia still has a lot to learn from its great power peers when it comes to implementing power projection forces and doctrines. Despite these changes, Australia's Army has long been the first responder for policy makers, spearheaded by elite Special Forces, the growing shift towards expeditionary capability in the form of amphibious regiments and the new doctrine of 'accelerated warfare' are both reshaping the role of the Army and the value it provides Australian decision makers. Nevertheless, drawing on best practice examples and no force conducts expeditionary-focused, power projection amphibious operations quite like the US Marines. The Marines and its globally deployed Marine Expeditionary Units (MEU) and Marine Air-Ground Task Forces (MAGTF) provide the US with an unrivalled, rapid response to contingencies ranging from humanitarian disaster relief and counter-insurgency to sea control and high-intensity, power projection combat operations against a peer competitor. Both the MEU and MAGTF concepts utilise US Navy LHDs and Landing Platform Docks (LPD) supported by surface combatants to rapidly deploy integrated, 'combined arms' forces, including amphibious landing, infantry, artillery, armour, combat engineers, both rotary and fixed wing air support (both lift and attack), logistics, medical and supply chain services. Command Element (CE): Providing command and control, including management and planning for manpower, intelligence, reconnaissance, operations and training, and logistics functions. Ground Combat Element (GCE): Composed primarily of infantry units, the GCE also includes reconnaissance (scout/sniper units); forward air controller; nuclear, biological and chemical defence; communications; logistics support and service; artillery; armour (including amphibious armoured vehicles and armoured reconnaissance); and combat engineer capabilities. Aviation Combat Element (ACE): Contributes to the air power component including fixed wing aircraft (ranging from strike to air lift and aerial refuelling), helicopters (both attack and airlift), tiltrotor (airlift) and UAV capabilities. Logistics Combat Element (LCE): Provides the majority of combat service support including heavy motor transport, ground supply, heavy engineer support, ground equipment maintenance, and advanced medical and dental support roles. Similar to their amphibious brethren, the US Army Brigade Combat Teams (BCT) consists of one combat arms branch manoeuvre brigade and support and fire units. They are typically made up of about 4,500 soldiers, with specialised infantry, mechanised infantry and light armoured reconnaissance, armoured units, divisional artillery, air, medical, logistics and command support. The specialised focus of BCTs provides a diverse, QRF capable of meeting any number of contingencies, without limiting the overall combat strength of the Army, by deploying a proportional, tailored, brigade size 'combined arms' force to global hotspots, within 96 hours, as opposed to a division-sized force at 120 hours. BCTs serve as the basis of the US forward-deployed conventional, ground-based, power projection and deterrence forces in continental Europe, with a series of modernisation programs to enhance the combat lethality and deployability of key platforms to combat continued Russian aggression in eastern Europe. Europe's increasing strategic instability, particularly following the Russian annexation of the Crimea in 2014, has placed renewed pressure on the traditional European-powers within NATO to begin responding to the new European 'great game'. In response, the UK embarked on a series of modernisation, reorganisation and force structure reviews to maximise the combat effectiveness and deployability of the British Army, as the force transitioned from asymmetric conflicts in Afghanistan and the Middle East to focus on the growing peer competition in Europe and throughout the world. Modernise and enhance the UK's ability to provide command and control assets for UK and coalition forces up to the theatre level. This restructuring and modernisation includes the creation of five multi-role brigades, keeping one brigade at high readiness, available for an intervention operation and four in support to provide the ability to sustain an enduring stabilisation operation. The multi-role brigades are to be modelled on the US Army BCT, incorporating their own infantry, armour, reconnaissance, artillery, engineer, communications, air, intelligence, logistics and medical support. air assault operations, with its own supporting units. This brigade, along with 3 Commando Brigade of the Royal Marines, will be trained and equipped to be one of the first ground forces to intervene in a new conflict. The introduction of 'Accelerated Warfare' builds on the reorganisation and modernisation efforts outlined in Plan Beersheba, which sought to establish the Australian Army as an integrated, combined arms force, which Major General Gus McLachlan, retired Commander Forces Command, described: "In Plan Beersheba we have the spine, the backbone of our 21st century, combined arms force, but it isn't the future. That is where Accelerated Warfare comes into play, it aims to make Army an adaptable and capable force." This focus on the capability, particularly the expeditionary capability of Army, is supported by Dr Malcolm Davis of ASPI, who told Defence Connect, "I feel that the ADF needs responsive and effective power projection, air and naval, and boosting Army's strategic mobility and amphibious capability. "It is better to build our force structure to project power forward, deep into maritime south-east Asia and beyond, and also have forward military presence in the Indian Ocean and the south Pacific." As Australia's role in Indo-Pacific Asia and the strategic balance of power continues to evolve, the Australian Army will be called upon to fulfil a range of roles beyond those it has conducted over the past 50 years. Power projection and the application of 'hard power' in both a high and low intensity capacity will dramatically reshape the Australian Army despite an unprecedented level of investment.